A diabolically delightful Texan Bourbon. There's a river in southwestern Texas called Devils River and is said to be the cleanest river in Texas. It's remote and away from human pollution and what's more, it flows underground for some time, which means it gets cleaner through gravel and limestone. Why's that important? 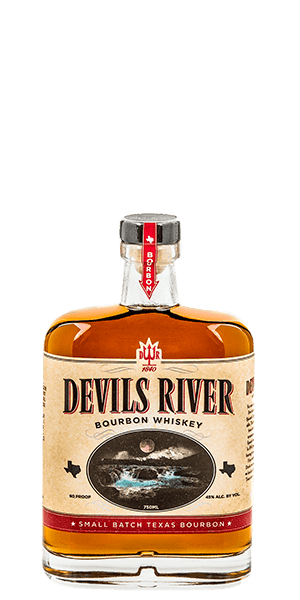 Because the Devils River is the blood of a devilishly divine Bourbon that would make every angel break bad. The constantly awarded Bourbon is made through a painstakingly meticulous process of picking the right grains, using proprietary yeast, distilling in traditional copper pot stills, and aging the Whiskey in #4 charred oak barrels. The golden devil that comes out is bold, rich and sweet. And since it's Texas we're talking about, it comes in a heavy-as-hell bottle. But the Bourbon inside is anything but heavy. It's loaded with flavor, but easy and nice on your palate like only a Texan can be. If you're a real cowboy, you'll sip it straight, while just one "rock" will mellow the demonic Spirit out for your pleasure. If you prefer cocktails, Devils River created its own, called Whiskey Buck, with lime juice and ginger beer. What does Devils River Small Batch Texas Bourbon taste like? The Flavor Spiral™ shows the most common flavors that you'll taste in Devils River Small Batch Texas Bourbon and gives you a chance to have a taste of it before actually tasting it. Peppery on the nose with notes of fruit, honey, caramel and vanilla. Strong and warm in the first sip, letting in oak, caramel and honey. Rye is noticeable and tasty, but in the back seat. Medium, spicy and sweet with enough warmness to coax another sip.